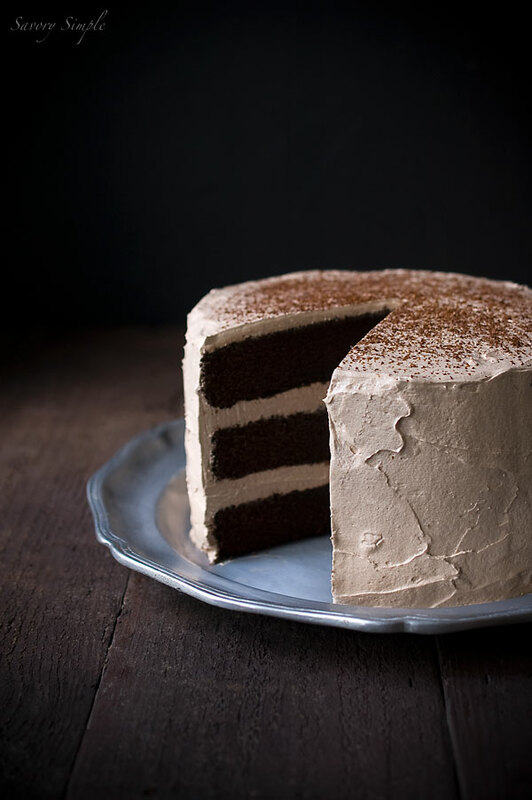 This Chocolate Espresso Layer Cake is one of the most popular cakes on my blog! Once you try it, you’ll know why. 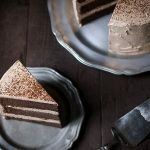 This chocolate espresso cake recipe is rich and flavorful, with just the right level of sweetness. The flavors compliment each other perfectly, and the meringue buttercream adds incredible lightness. Keep reading to learn how to make my chocolate espresso cake. I love layer cakes but I have to admit they stress me out. There are so many all or nothing moments where there’s just no turning back. Getting the three layers of cake to be even and level. Making sure the buttercream doesn’t break. Flipping layers of cake upon frosted layers of cake, hoping that each one sits just perfectly so that the sides are even. It makes my palms sweat. No matter how many times I’ve made layer cakes, I still get nervous at these defining moments. 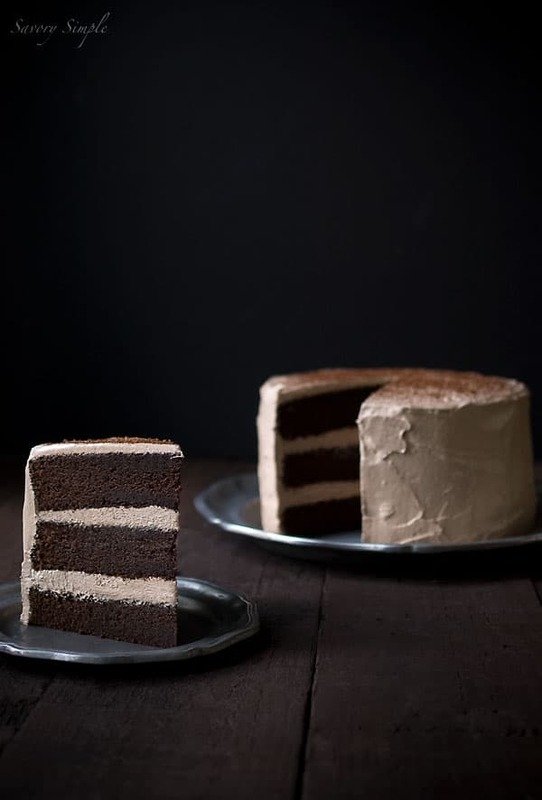 I was so thrilled with the way this chocolate espresso layer cake turned out. I couldn’t have asked for better results. I haven’t always been that lucky, though! I always procrastinate cutting that first slice. I’ve spent so much time with the frosting and everything looks so beautiful from the outside. Will it look as good on the inside? Will the frosting layers be even? Will the slice pull neatly away from the cake so that I can get a picture of both together? Will the center have an even point? Sometimes, when I’m lucky, it all comes together perfectly in the end. And when that happens, it feels like magic. 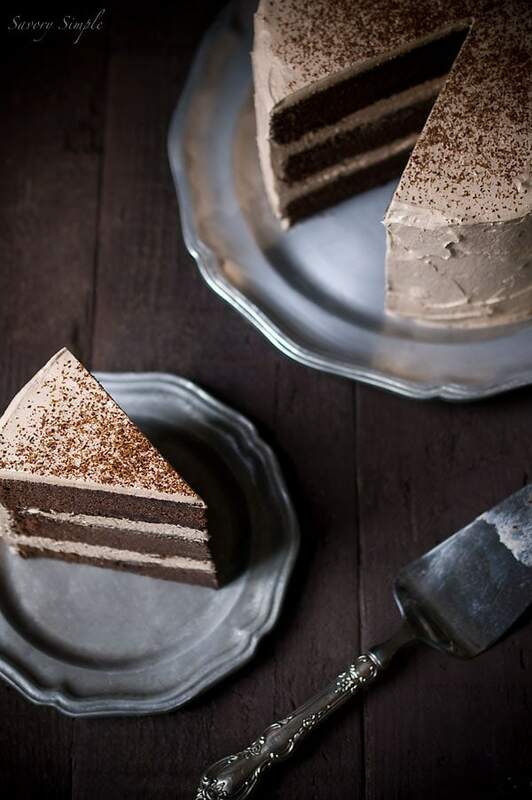 This chocolate espresso layer cake was definitely one of those magical moments. Update: I’m getting a lot of questions about how I got such a clean slice of cake. My method: use a long, sharp knife. Run it under hot water, wipe it dry and immediately cut one slice in a straight down, non-sawing motion. Don’t pull the knife up, pull it straight out toward you. Then repeat the process for the other side, starting with the hot water. That’s how I do it! Also, I use Valrhona cocoa powder (linked below under “Tools I Used”) which is a high quality cocoa powder used by most high end bakeries and restaurants. Using a standard grocery store cocoa powder will work perfectly well but the cake may be lighter in color). 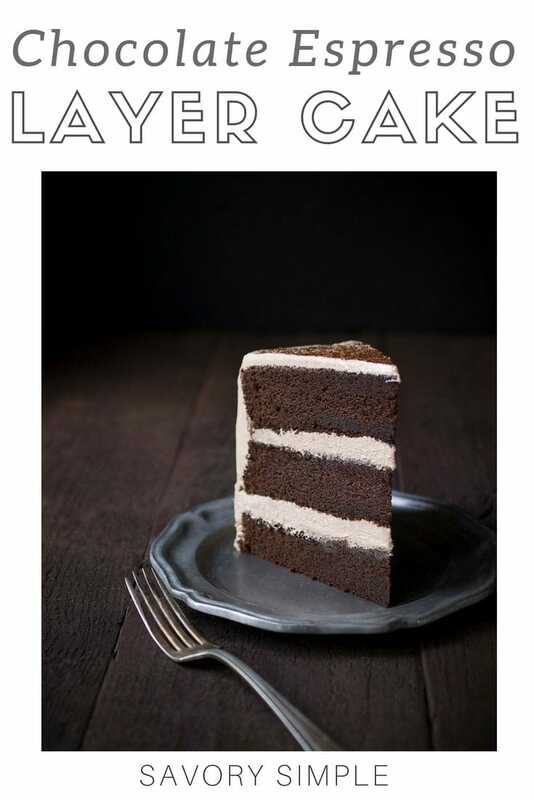 Want to learn more about layer cakes? Check out my post on how to make a perfect layer cake! Want to learn more about buttercream? 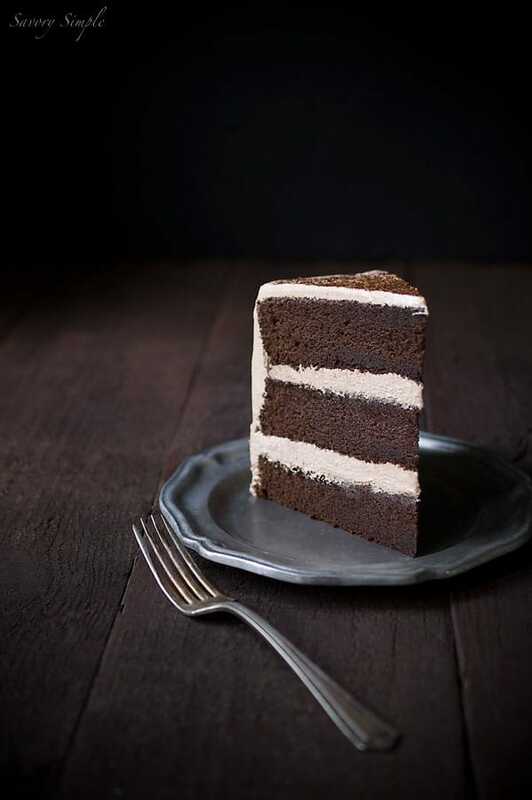 This chocolate espresso layer cake is absolute decadence. It's filled with cocoa powder plus added richness from espresso, and each bite bursts with flavor. Preheat the oven to 350 degrees F. Place an oven rack in the middle position. Lightly spray the bottom of 3 8-inch cake pans with baking spray and then cover them with parchment rounds. Set aside. Whisk together the flour, espresso powder, baking powder and salt in a medium bowl. Sift in the cocoa powder and whisk until the dry ingredients are evenly combined. In a separate small bowl, combine the half and half, espresso vodka and vanilla extract. Add sugar, water and corn syrup to a medium sized sauce pot. Cover and turn the heat to high. Once the liquid begins to simmer and steam has developed, remove the cover (this helps prevent crystallization). Using a candy thermometer, cook the sugar to the soft boil stage, 235-240 degrees F.
While the sugar is cooking, whisk the eggs on high in a stand mixer with the whisk attachment until a soft peak has formed. Turn the mixer speed down to medium low and very slowly pour the syrup down the side of the bowl into the egg whites. Don’t pour the hot syrup directly into the meringue. Once the syrup is completely incorporated, turn the speed to high and allow the meringue to continue to form a stiff peak while cooling down. Mix on high until the meringue has reached room temperature. To speed up this 15-20 minute process, ice packs can be placed around the bowl. Once the meringue is room temperature, slowly begin incorporating the soft butter on medium speed. Once all of the butter has been incorporated, turn the mixer speed up to high and very slowly add the chocolate, espresso and vodka. Spread approximately one cup of buttercream on the cake and spread it around evenly with an offset spatula. Add more buttercream as needed to reached the desired thickness. Repeat with the second and third layer (don't forget to remove the parchment each time). Use an offset spatula to apply a thin layer of frosting to the side and top of the cake. Chill in the refrigerator for 30 minutes to set this first layer of buttercream. Cover the entire cake with a final layer of frosting. Grate some unsweetened or semi-sweet chocolate on top of the cake for decoration, if desired. Italian meringue buttercream is an advanced frosting. To simplify the recipe, substitute any regular chocolate buttercream frosting and add some of the espresso powder (here is a good one). Also, check out my article all about buttercream, including tips on fixing it if it breaks! I found the same recipe at this address. is it you or someone else? amazing cake i must say. I just baked it. and the aroma is oh so heady!!!!!! Sigh, they stole it. Thank you for letting me know and I’m glad you enjoyed it! I just did it today for my boyfriend, flavor or the cake to freaking die for. In another hand i messed up the frosting, so i put it soft on the cake and put the whole cake of the fridge. Its getting good. I will give 1000%props to this frosting. I never like buttercream but this italian is amazing. Thanks. Hi! I am having some trouble with my cakes… the batter looks a little curdled? Why would that be? Hi Lucy, I need a bit more information to help troubleshoot. It’s always kind of tough when I’m not there. At what step was is looking curdled? Before or after you added the flour? Sometimes the batter will separate slightly before adding the flour mixture, but the dry ingredients will bring it back together again. The step where you turn the mixer on medium speed for 30 seconds also fluffs things up and helps with the batter structure as well. Maybe my problem is coming from the flour? Do you happen to know the measurements in cups? Hi Lucy, are you using a kitchen scale to weigh the flour, and if not, what sort of conversion are you using? In most of my posts, I’m pretty adamant that people weigh the flour, because cup measurements create extremely inconsistent results. I’m realizing I didn’t do that in this post/recipe and I really need to update it. Hi it’s me again! I have made this in the past and that’s the only reason I want to get to right so badly. But my mixture is very thin. Is that normal? And it looks like I‎t has little flecks of the butter in I‎t? Im very confused because I am following every step… overall the only reason im concerned about the batter is because my cakes aren’t really rising that much. Is that normal? Sorry for all my questions! Hi there! Each layer should make around 12 standard or 24 minis. Possibly a bit more since you only fill the muffin tins halfway regardless. I’ve made these into cupcakes several times over the years, but it has been awhile. Also, they will take less time, so start checking for doneness at around 22 minutes. Dutch processed cocoa is unavailable in my small town. How can I alter the recipe and use regular natural cocoa? Which brand espresso powder would you recommend? I like the one from King Arthur Flour! I also purchased a good one at Williams-Sonoma, once, and I bet you can find some other good options on Amazon. Just look for something with a lot of good ratings and a reputable seller. Hi, I only have a hand mixer will that change the texture of the buttercream? Hi Mercedes, I definitely wouldn’t recommend making the buttercream without a stand mixer. It needs to be mixed for a good 20 minutes.